INFINITE DREAMS Games Forum - View topic - Can knockdown 2 – sequel is coming! Can knockdown 2 – sequel is coming! Can Knockdown was an instant hit and reached the #1 spot in 67 countries since December 2010. This free and universal game has been downloaded nearly 2,5 million times in just one month! Now forthcoming sequel will try to beat that record! Yes, we are working on sequel and you are welcome to share this information with the rest of the community. 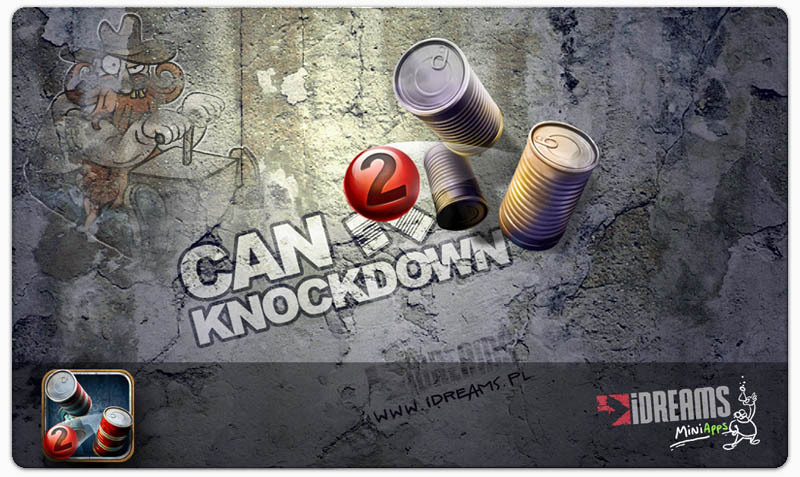 Soon we will reveal more info about Can Knockdown 2. Please back to this thread regularly. P.S – If you have any thoughts or requests regarding the sequel feel free to leave your comments here. Re: Can knockdown 2 – sequel is coming! First screenshot – game menu. To choose game mode player need to hit one from three cardboard boxes. You are most welcome to share your opinions or suggestions with us. Last edited by ArturID on Fri Feb 11, 2011 3:25 pm, edited 1 time in total. 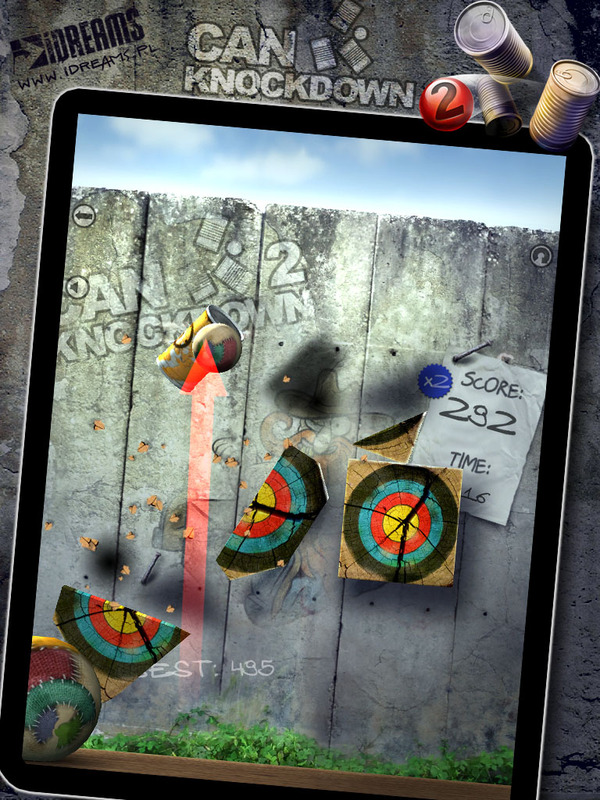 Here is something about “Target Mode” where players can prove their accuracy by destroying popping-up moving targets and fight against time. Perfect shot stops the timer for one second. The more accuracy you are, the more time you have to collect higher score. While you are aiming targets, special bonus cans appears. If you hit one of them you can expand the final time for few seconds. As always we are counting on your opinions and thoughts. Let us know what you think about new game mode. We are very exited to release game soon in the App Store. 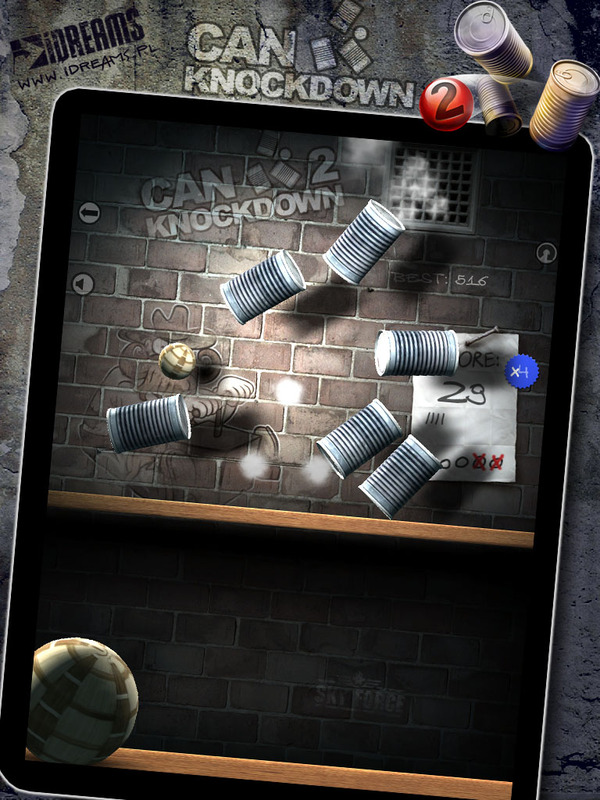 Next screenshot from Can Knockdown 2. This time you can admire the improved and polished all time classic mode, where player must fight against own weaknesses while aiming and throwing balls at piles of cans. Collect bonuses, avoid shields and knock down cans moving on a conveyor! 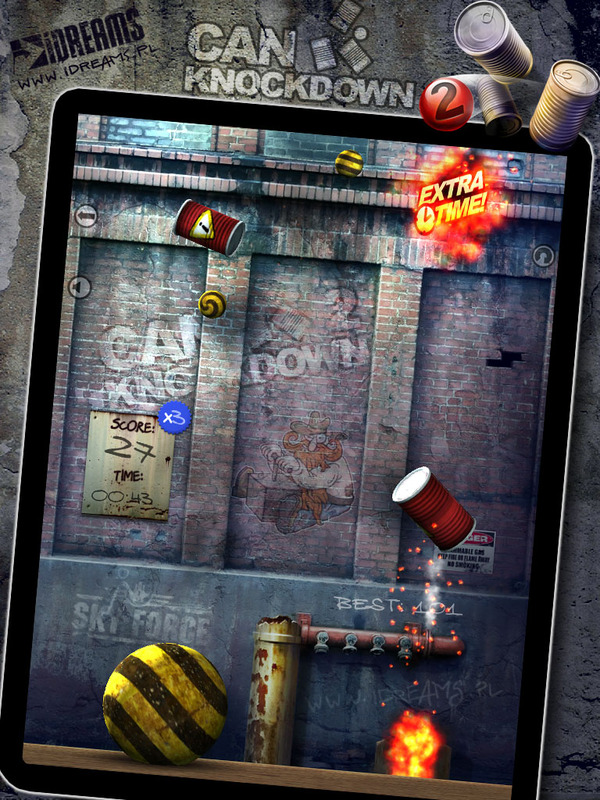 Check last and fresh screenshot from Can Knockdown 2. Today we revealed sniper mode where players need to prove their accuracy in destroying explosive and fast-moving targets while fighting against time. Do you think you can be the master of precision? Can Knockdown 2 is coming. We are very delighted to release game soon in the App Store. In the meantime we would like to share some new information’s with you. Below Can Knockdown 2 achievements. Hope this small sneak peak will encourage your curiosity. 1. Juggler - Bounce a ball from the wall and hit it with the next one. 2. Ricochet - Knock a can down with a ball bounced from the wall. 3. Last Hope - Beat the level in Classic Mode with only one ball left. 4. 3 in a row! - Get three strikes in a row in Classic Mode! 5. Eyecatching - Score 5 bullseyes in a row. 6. Semi-Pro - Score a total of 100 bullseyes in your career. 7. 4 in a row! - Get four strikes in a row! 8. Lasersight - Score 10 bullseyes in a row. 9. Seasoned Playe - Score a total of 500 bullseyes in your career. 10. Can Recycler - Knock down a total of 2000 cans in your career. 11. 5 in a row! - Get five strikes in a row! 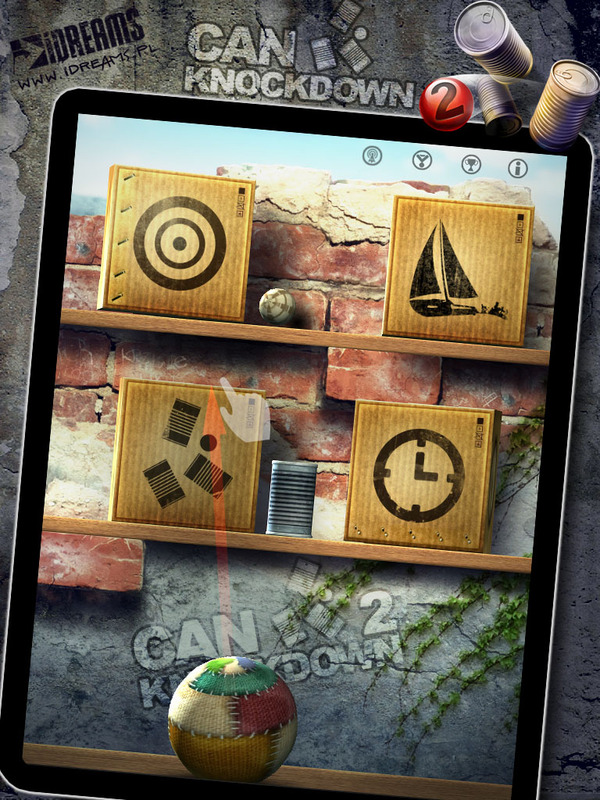 Yes, this is the moment when we can put our cards on the table and say Can Knockdown 2 will hit the App Store on 1 March! To celebrate Can Knockdown’s 2 worldwide premiere, we are planning to sell all our games for 0,99$ only! The same low price for all games (including Can Knockdown 2) will be a limited time offer. Below fresh and hot game trailer which reveal nearly everything . As usual we are waiting for you feedback!